Party comes with different activities and games. Drinking and summer games go hand in hand. Whatever kind of games you are planning, it is important to choose the ones that will make all the participants enjoy. Your party will never be complete without drinking games that will bring joy and fun to everyone. If you want to make it even cooler, you can also add some dancing lights, conversation, and music. Most people especially those students will soon be going on vacations and enjoy their summer get away with their friends and families. If you are planning to go on a summer vacation, yet you don’t have any drinking games ideas, you don’t need to worry for we have listed here the best drinking games. Flip Cup is a good party drinking game. In this game, there are two opposing teams that will compete against each other. Both of the teams will position on the opposite sides of the table and should keep all the cups at the edge of the table. The goal of the game is to finish the drink and then flip the cup with just three fingers. The cup should be in an upside-down position. When all the cups are flipped, it is the time for the next member to begin. The first team to complete the game wins. This is a perfect game to boost the team’s unity and camaraderie. Buzz is one of the easiest game to play during any kind of party. The rule of the game goes as follows: each of the players start counting numbers aloud, however they can’t say the number 7, any number including the number 7, or a number that’s divisible by 7 (14, 21, etc.) instead of saying this number you must replace it with the word “buzz”. If you don’t, you have to drink. It’s very simple! If this starts becoming too easy, you can add in the “Fizz” element. When any number that’s divisible by 11 (22, 33, etc.) you must change directions. This is indeed one of the more challenging drinking games you can play. 1, 2, 3, 4, 5, 6, BUZZ!, 8, 9 10, FIZZ! (direction change), 12, 13, BUZZ, 15, 16, BUZZ, 18, 19, 20, BUZZ, FIZZ (direction change) etc. This fun and exciting drinking game will make all the participants burst into laughter. The mechanic of the game is very simple; the group needs to sit in a circle and asks the question, “most likely”. For example, “Who would be most likely to eat pizza?” After counting up to three, everyone will point to the person they think that the one who is likely to do it. The person who has the highest number of fingers pointed at him will be the one to drink. Bite the bag is definitely one of the best drinking games you need to try. All you have to do is to put a brown bag on the ground then take turns to lean then pick the bag with the use of your mouth. With this game, you are not allowed to use your hands and the only thing that can touch the ground is your feet. The consequence of the game is, of course, you need to drink. For every round of the game, one inch of that bag will be chopped and this will go on for several rounds until the only one left is the bottom of the bag. This is a great game to know the secrets of your friends. The goal of the game is to share something you have never done before and your friend who has done it will sip their drink. For example, when you say, “Never have I played in snow” and then all of the friends who have done it will sip their drinks. The goal here is to make your friends admit the embarrassing stories of their life. Therefore, watch out for their secrets! If your party is quite boring, play this game with your friends! This is considered as one of the easiest drinking games. This game is perfect for people who start to easily get bored or sleepy. What you need to do is to sit around the table and then choose a hand motion for yourself. You can choose any hand sign that you prefer like a peace sign or victory sign. Then every member thumps on the table when the game begins. Start doing your hand motion and then do some additional actions while your friends are still thumping. The one whose hand motion was repeatedly done and the one who takes too long to react will have a sip a drink. To add more fun to this game, you can also include some sounds to the actions. Are you looking for a game that does not require too many resources? Well, a quarter will not only provide you with fun, it is the answer to your search. For this drinking games all you need to do is to gather around a table with a shot glass or regular drinking glass at the center of the table. Failure to follow the rules leads to having to take a sip of your drink. This drinking game is a classic game that has been known to many people and parties. Everyone also knows the rules of the game and this is often called as the name game. All you have to do is to gather around the table or in a circle. The first player needs to say the name of a famous person, for example, Tiger Woods. Then, the next person next to the first player needs to come up with a person name that starts with the last name of the previous person. If the last name is Woods, then the next player needs to give a name that starts with letter W. if the next player unable to give a new name or the name is already mentioned. The next player after the first one needs to drink while thinking of another name. If the drink is already finished but the player is still thinking, then the player needs to be passed to the next player. Like any other game, this is also one of the best drinking games loved by people for specific types of parties. The entire team needs to gather themselves in a circle or around a table. The rule of the game is very simple. The first player to start needs to whisper a question to the next player in the circle. You have to take note the answer to the question should be about someone in the game. For example, “Who is the youngest?” The person asked should provide the answer to this question and the answer must be aloud. If the person or any other player who wants to know the secret, they must take the drink and then the question should be stated aloud. This game is a true test of your curiosity. This drinking game will boost your imagination. It can be played with two friends, partners but the more players, the merrier. The objective of the game is to know the truth and the lie of your friend. The opposing players need to face each other. The first one will give three points about himself. Out of these three points will be a lie about that person and the other two are truths about his life. The goal of the game is for you to guess the wrong statement of your opponent. It is very important to sit in the front facing each other, to see each other’s facial expression. Facial expression can help you guess the answer. By simply looking into your opponent’s eyes and expression, you can easily find out the answer. The consequence of the player who fails to guess the answer is to drink from their cup. Beer Pong is considered as one of the rop drinking games and has been the center of most parties. It’s gotten to the point where tournaments are a common event. The rules of the game remain to be the same but in some parties; the basic rules of the game may be modified. This is a fun game for two or four players. The objective of this game is to toss a ping pong ball into one of the cups. Each of the players needs to try tossing the ball into one of the cups. The opponents are not allowed to move the cups in anyway. Once the ball lands on the cup, the opposing team needs to drink their drinks from the cup (or from a drink in hand to avoid germs that may be passed by the ping pong ball). If you decide to use beer inside the cups, make sure to have a clean water beside you to clean the ball after several tosses. The team to first complete the side is the winner. Beer pong is one of the best drinking games for any party and provides an exciting and thrilling experience. If you happen to find yourself becoming immersed into the game, you should consider looking for a beer pong table to practice for tournaments! Avalanche is one of the best drinking games commonly done in most parties and events. You can play this game with your preferred number of players. All you have to do is to sit around a table and have a glass of drink with you. There are certain rules for all the players around a die. First, the player who is in action passes the glass along the die to the next player. Then, the same player needs to add more alcohol and then passes it to the player next to him. The player needs to drink whatever drink is in his or her glass. Each of the players needs to yells “floor” at every player to either fall or downward to the floor. The player to do it last will gulp down all his drink. There are many products online that can add up to the fun and excitement. Most of these products have earned high ratings for its ability to provide entertainment to every user. Below are some of the games you can try. Loaded Kings is one of the top drinking games on Amazon. This is also an ultimate choice for partygoers. This game is similar to Ring of Fire, Circle of Death and the Kings Cup. This can provide you with countless hours of fun and excitement with tour friends. Each of the cards is 100% waterproof so you don’t need to worry about the spills of the juice into the cards. The cards are made from durable plastic materials and it can withstand scratching, bending and creasing. Add this to your party events and expect that each of the players will definitely enjoy the drinking game. This is one of the best drinking games you need to try. Find out which of your friend can mess up with the help of this game. 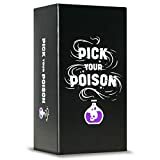 The pick your poison cards contains different poisons that you will surely love. You need to choose one judge from all the players. The game contains a game board with 350 poison cards, 5 house rules, and a score sheet. If none of these interest you or you’re looking for more party games, click here. The above are the best drinking games you can include in any party that you are planning to host. However, some of these games are perfect for adult parties but you can also modify these games to be applicable for kids’ parties. Kids will definitely have a blast if they feel included in such activities. These will definitely bring fun and excitement to everyone!